The word "periodontal" means "around the tooth." Periodontal Disease (also known as "gum disease", "pyorrhea" or "periodontal infection") is an ongoing bacterial infection in the gums and bone around your teeth. This infection leads to an inflammation under the gums. If it isn't treated, the inflammation can destroy the bone around your teeth resulting in tooth loss. Periodontal infection is the cause of 75% of all adult tooth loss. More importantly, research has associated periodontal infection to several serious medical problems, including; heart disease, diabetes and stroke. As ongoing research continues to define how periodontal disease is associated with these and other health problems, good oral health is essential. Good periodontal health is a key component of a healthy body. How Does An "Ongoing Infection" Work? When you were a child, did you ever get a bad scrape that became red and swollen? That was caused by bacteria that got under your skin. The area became infected and inflamed. It may have lasted for days or weeks, but eventually the inflammation went away. The inflammation disappeared when your immune system conquered the bacteria and the infection healed. With an ongoing infection, your immune system never wins the battle; the infection keeps growing and the inflammation never goes away. 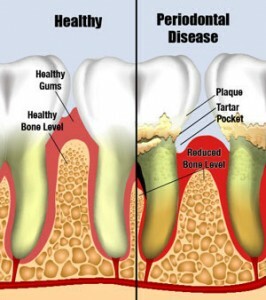 Periodontal disease is an ongoing infection in the pockets around your teeth: Your immune system cannot conquer the bacteria, and without treatment, it will get worse. What Can Cause a "Burst" of Infection Activity? When your infection has a burst of activity, or when there are signs that this is about to occur, it is very important that you contact us without delay to schedule a comprehensive evaluation. We will be able to determine the treatment necessary to control your periodontal infection and set you on a path toward excellent oral health. Periodontal infection is usually painless until it reaches an advanced stage. However, there are some symptoms which can indicate the presence of periodontal infection. If you notice any of the above warning signs of periodontal infection, please contact our office for a periodontal examination. Important Note: Your gums can look and feel quite normal and yet deep pockets of periodontal infection can still be present. To be certain about any periodontal disease, have your periodontist examine you for signs of infection. A periodontist is a dentist who specializes in the prevention, diagnosis and treatment of periodontal disease. Many periodontists have also taken advanced training in the placement of dental implants. Periodontists receive extensive training in these areas, including three additional years of education beyond dental school. Periodontics is one of the eight specialties recognized by the American Dental Association.